Our new church family! We placed membership yesterday and it feels so wonderful to be back with a great group of people. Our location. There's so much to do within a couple of hours of our new home! Austin meeting new friends at church that are good kids. Warm welcomes from new friends and neighbors. All the errands I have to run today. Our trip coming up next weekend, TO THE MOUNTAINS! Every bit of laundry. It's neverending and I want to have at least one day where I don't have a thing to wash.
Purchase and install the wall mount for our TV so we can get it off of our fireplace. Nope, we still haven't done that. My voice. People cannot hear me half the time, and I am talking as loud as I possibly can. I wind up with my throat muscles feeling tired after trying to talk loudly when I'm out with people. Belle will learn how to walk on a leash by my side instead of pulling. It's a process, but we'll get there. So.... Belle has been bringing me her treasured bones lately. Not the every day run of the mill bones, but the ones that she truly loves and tries to keep hidden from everyone in the house. She brings them to me and I'm pretty sure they are a gift from her. If I try to give it back to her, her ears go down and she looks offended. I asked Carl what I'm supposed to do with the bone and he simply said, "Start eatin'." Sorry I haven't been blogging lately. 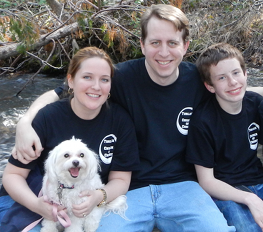 I've been really busy during the days, and nights are reserved for family time. I hope to have a few minutes to blog soon, but until then, here. Watch this video. It's a sure thing that it will make you smile and say, "Aww." The sweet card and letter my husband gave me for Valentine's Day. The beautiful weather here in the valley. You! Thank you for reading! Belle's cuddles since she got a haircut. Three in the bed makes it a little difficult to sleep, but how she curls up under my chin is worth it. I have a phone that I can actually talk on, so I get to catch up with my friends back home. My trip home that is coming up. Sammy is a year old now, and I SWEAR it was just yesterday that sweet baby was born. My sweet Georgia baby, I don't want her to forget me being so far away. Potential jobs. I've been on the hunt, and I hope I find a job soon. Settle down into a church. We're having a heckuva time trying to decide which one to go to. Put pictures in my empty frames. Seriously, they have been empty for over a year. Ridiculous. Purchase and install the wall mount for our TV so we can get it off of our fireplace. The fact that I require more sleep than the others in my household. I don't know why it is, but I'm going my best to just accept it. I already go to bed at 9:30 every night and comfortably sleep till 8 when my alarm goes off. We have tile kitchen counters. I do not understand why anyone would make their counters made of tile. Because it's cheap? Maybe. I don't know, but I do know that grout is a bear to clean and I'm constantly lysoling the kitchen (especially after cooking meats!). This wasn't my idea, the whole countdown thing. I jumped on he bandwagon from Lori. Thanks for the idea, Lori! Yesterday, I told Carl how much I missed the Florida rain. Truth be told, I probably told him about 5 times. It even did more than that. It's like God said, "You miss the Florida rain? Let me send you some rainy weather. I know how you love it so." It's rare for it to rain here in the Valley. Now, I'm not so used to hail, so I filmed it. And for the record, the reason I kept telling Austin to come inside is because I don't want him to be sick on this 5 DAY WEEKEND he gets. Not because I'm a party-pooper. Last night, the three of us sat down to a delicious Valentine dinner made by yours truly. 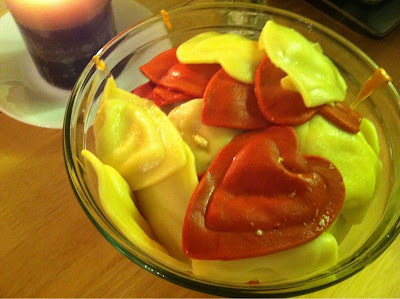 We enjoyed heart shaped ravioli, in a home made tomato-cheese sauce. 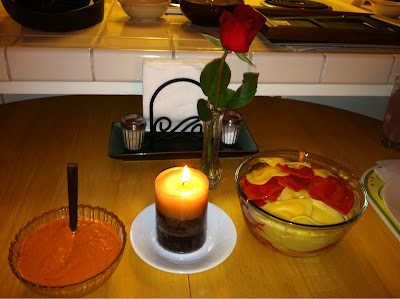 And you know, since it was Valentine's day and all, we ate by candle light with a rose on the table. It wasn't the type of Valentine's day Carl and I are accustomed to, but it was still a lovely evening. Carl and I are going on a date for the two of us this coming weekend. I wanted to show you our adorable pasta. Take a look! I hope your day is full of love, romance, and appreciation. Although love, romance and appreciation often go unnoticed, I hope today is the day that you take the time to feel all three. And, to give all three. When I was little, Valentine's Day consisted of carefully tearing the perforated cards that my parents would buy from the drugstore, so I could give one to each of my classmates. As I got a little older, Valentine's Day consisted of me blushing when a boy would give me a card professing his undying love for me. Who said girls were the only dramatic ones? Sheesh. Then I got a little older and my Valentine's Day consisted of me getting a card at school that said, "I love you." And I kept my classmates guessing at who the sender was. Although, I knew who it was from. My daddy. Then came the teen years full of teddy bears, balloons, stuffed animals, chocolates and roses. Now Valentine's Day is still full of all those little sweet gestures, but it's more than that. It's still a romantic day that we make sure to love on each other a little extra. But, being married, it's not only chocolate and roses. It's about loving the real stuff, too. And, taking the time to really appreciate it. This song I have for you to listen to is not about Valentine's Day, and it's not about romance. It's about real life. 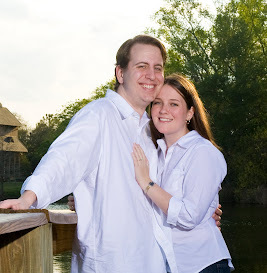 It describes me and Carl pretty accurately, and I'm sharing it with you because these are some of the little things that we appreciate in one another. We do our best to not take them for granted. And this Valentine's Day, I hope you, too, find the little things to appreciate in your relationship with your loved one. I've been really busy this week applying for jobs, enjoying my new phone, and staying on top of housework. Let me say, I don't think the dishes will ever learn how to clean themselves. True bummer, let me tell ya. Belle has a new friend at the park who she just loves. She likes waiting for her other friends to leave so she can have him all to herself. His name is Gizmo. I have no idea what kind of dog he is, but he's bigger than she is by about 15 pounds and he's got long brown hair. Here's a video of them playing together, in case you want to see. And Belle also has another new friend who she met just two days ago, named Happy Feet. Happy Feet is also bigger than Belle, but Belle is quite fond of her too. She's, get this, part chihuahua, part terrier, and part dalmatian. Crazy, right? Ahh... love the doggies. During our lovely settling in period, we have encountered several laws, if you will, in California, that just make us say, "Huh?!" We're quite surprised to learn what we've learned this week. Let me fill you in. You need a license to ride a bicycle. It's good for the lifetime of the bike, and it's only $4. I don't know the purpose of this, but okay. You need a permit to have a yard or garage sale. You can have no more than two in one year. If you toast your sub at subway, you get charged an extra tax. If you choose to not toast it, you will still get charged the tax if you take the sub "to go" instead of dining in. The only way to not get charged that daggome tax is if you eat IN the restaurant and you eat your sub cold. Ridiculous, I tell you. Seriously now, who's gonna be the first to stay in our shiny guest room? I saw this and I thought it was so cute, you just have to watch if you're a dog lover and Christian! "Do you have friends where you're going?" That was a line from Eat Pray Love, an inspiring, really good, down to earth book. When I read it, I couldn't help but reread that one line, and then read it once more. When we were packing up to move to California, so many people asked me, "Do you know anyone out there?" My answer was always the same. "No." In the back of my mind though, I just knew I'd have friends, and even a complete family once I got out here. A church family, that is. I expected to be as involved with our new church as I was with our old one. Unfortunately, due to unforseen circumstances in the past two weeks (I was sick once and Belle was sick the next week..I was up all night making sure she could make it to the bathroom outside...), we haven't been to our new church yet. However, I've started hanging out, on a regular basis, at the dog park. It sounds silly but it's a good time to be had...if you're a dog person. I get my animal loving side from my dad, otherwise known as Dr. Doolittle. You'd be surprised how often animals approach him and seem to communicate with him. He's like Ceasar Millan's European cousin.... or something. Which is why I can't wait till my dad comes to visit and I can bring him to the park with me. We can sit on the hill with everyone and watch the dogs all have a good time. We'll have a stash of treats in my bag, a blanket to lounge on, and some club soda while we sit in the sunshine watching the pups play and communicate with one another. And the dogs aren't the only ones that get to socialize. (Heck, sometimes Belle prefers to just sit in my lap and not socialize at all. And that's okay.) Their humans do, too. Being without knowing many people in the town, going to the dog park has become almost a form of therapy for me. I sit on the hill in the sunshine with a great group of people and we all chit-chat. About life, about home, about our dogs. It's like we have an automatic bond. I've met some really great people at the park. I was introduced to an exercise program through a park goer, invited to church by a park goer, invited to a youth fellowship held every Sunday for Austin, found a dog-sitter, a groomer, and even a babysitter. As convenient as the networking is, I'm not there for that. I'm there just for the friendships, and because it's so relaxing! I get to watch my best friend frolic and play with the other pups while I visit with them, and as the afternoon creeps in, we watch the fog roll into the valley. Time quickly slips through my fingers. Four hours have gone by and I jump up and scramble to get home to get that roast in the oven. Where on earth has the time gone?? Ah, time flies when you're having fun. It's such a natural, easy going type of fun. Some people like to go dancing and clubbing... me? I like the dog park. Last weekend, Carl, Austin and I took a day trip to San Francisco. It was my first time in the city, although Carl had been there several times and Austin there once. We had a great time exploring the city, riding the cable cars, cruising around Alcatraz and the Golden Gate Bridge, and seeing all the street performers. Everywhere we went, there was someone doing something on the street for money. Guy playing a guitar? Check. Guy singing? Check. Clown blowing balloons? Check. Guy painting with spray paint? Check. Guy getting others to enter a hot dog eating contest? Check. Guy dressed as a bush that jumps out at people to scare them? Check. We started our day off at the MacWorld convention. It was kind of neat seeing the vendors show off their products. Some were better than others, of course. And some wouldn't even bother talking to me once they realized I didn't have an iPad. All in all though, it was fun. We took a lunch break and went to a small restaurant called Mel's Diner. Austin may or may not have tried Carl's mimosa. We enjoyed our food and then headed back to the convention to meet up with Katie, a friend from Gainesville. Note: while editing this post, I realized now you're thinking the picture you're about to see is of Katie. It's not. I didn't think to get a picture with her, so it's just me and Carl. Hope I didn't let you down. we headed to the Pier for a cruise around Alcatraz and the Golden Gate Bridge. Austin was at the back of the boat filming a seagull that was following our boat. He looked like he was attached to the boat like a kite. See the korean girl behind us? We befriended her on the cruise. "My name is Kenshzi, but that is too hard for Americans to say. So, you can call me Stella." Here's my hubby in front of the prison. The Golden Gate Bridge is behind us in this shot. It was really pretty, even though it was foggy. But, I like the fog, remember? Oh, and I learned not to tell the locals that I like the fog. Else they will scoff at me. And possibly end our conversation with an eye roll. Hey, I'm from Florida. I have sunshine all the time. It's nice to see a change, okay? Stella took these pictures for us. And so, that was our trip. Until next time, San Francisco. Until next time. all...day....long. You know, cuz rice-a-roni's a San Francisco treat.